You’re 10 weeks into your 12-week Level II Fieldwork placement and you find out that you won’t be passing. I’m sure there are more than a handful of you who have browsed various internet forums and read through horror stories of Level II placements that have ended up less than successful. You’re more than likely feeling a wide range of emotions right now: sadness, incompetence, frustration, despair, hopelessness. The whole 9 yards. I was 10 weeks into my fieldwork placement when I was informed I wouldn’t be passing. I opted to forego the last two weeks of the placement simply due to the fact that it would have been very difficult for me to plan treatment sessions and carry a caseload with so much running through my mind. You need to take care of yourself before you can help others. Depending on your own circumstances, make sure that you’re doing what you can do maintain an occupational balance. Go to the gym and work out, go for a run, find something that you enjoy doing to take your mind off of things until you feel more ready to figure things out. Probably the last thing you want to hear right now, but think of yourself as a client dealing with this situation. You’re more than likely bouncing in between the five Stages of Grief. As you know, this process is different for everyone. I spent most of my time in the anger and depression/sadness stage and it took me awhile to get to accept that I would be doing an additional 12-week placement somewhere. The point I’m trying to make here is that it’s completely normal to feel the way you’re feeling and that eventually, you’ll be able to make the adjustments necessary for the future. Your school doesn’t want you to fail. Talk to your mentor, the academic advisor, or a close friend or colleague that you trust about what transpired. Having someone to talk to and confide in is helpful, especially in a time like this. Your mentor and academic advisor will help you figure out what happened, what to do, and can offer advice on how to make your next fieldwork placement successful. Sitting down and reviewing your fieldwork evaluation can also be a valuable resource to plan for the future. Once you’re able to reflect and identify what you need to improve, you’ll feel more ready to take on your next placement. It took me a LONG time to get passed who to place the blame on when I failed, especially since I passed my first Level II Fieldwork with no issues. 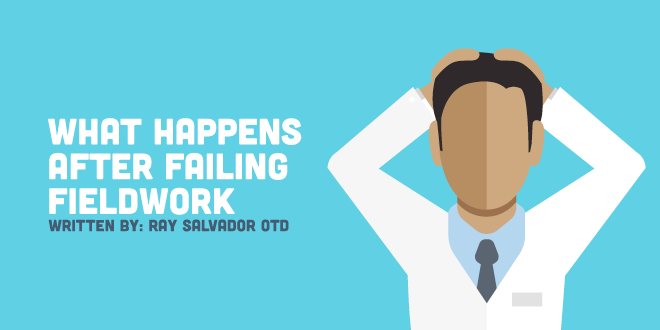 Failing fieldwork, initially, can be devastating especially being a student. When you’re back in a mindset that will allow you to address the situation and do some reflection, it’s important to try and use the placement for what it’s meant to be, a learning experience. Figure out where the disconnect was and create goals for yourself. Sometimes it may just be a mismatch with the setting, the clinical instructor, or both. The important thing to realize is that, in the grand scheme of things, it’s fieldwork, and it’s better that this happened now rather than during your first job. Things like this happen for a reason and trust me when I say that you’ll encounter many more challenging situations in your future career as an occupational therapist. As cheesy as it may sound, there’s absolutely no reason you should let an unsuccessful level II Fieldwork define who you are as a therapist and, most importantly, a person.